Ski season is so close I can taste it, but until a couple more inches of snow sticks to the rocks, I’ll get my fill through ski trip reports from last season. If you ever might go backcountry skiing in Montana, check out Greg Seitz’s video of a trip he and friends Ian and Matt took traversing the backbone of the Bitterroot Mountains. It’s an incredible twenty five minutes of powdery slopes, interspersed with glimpses into the “glamorous” reality of a multi-day ski trip. This video makes me aspire to follow their tracks someday. The map in the video does a great job of showing the extent of the trip, but it doesn’t include a topo for others to follow. I made my own topo map of a potential ski trip through the Bitterroots using hillmap.com tools so that I could see if the trip would be fun for me this year. 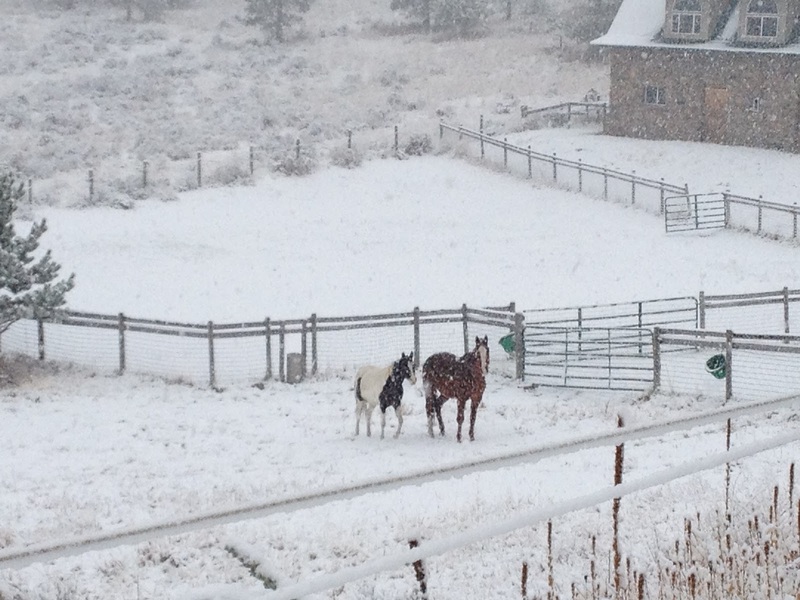 And to daydream about skiing. 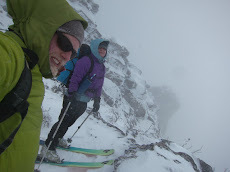 The Bitterroot traverse in Greg’s video started at Lost Horse Canyon and ended after skiing Lolo Peak to Highway 12. I find that the best tools for plotting a route in a new area are in the Data & Analysis tab: the hillmap.com slope analysis tool allows you to highlight slopes greater than the angle of your choice (for example, highlight slopes greater than 30 degrees), while the CalTopoSlope layer highlights slopes of pre-designated angles. 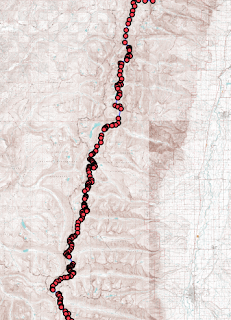 I chose to use the CalTopoSlope layer for this project because it highlights slopes on the entire map, while the hillmap.com slope layers analyze one region at a time. 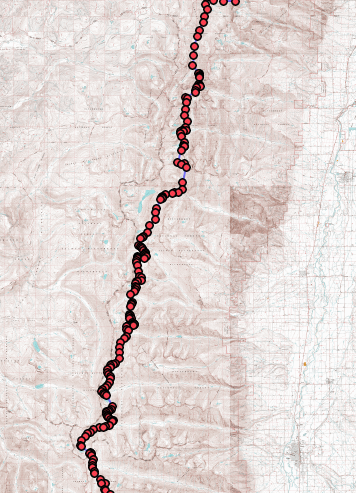 I plotted a route from Lost Horse Canyon to Lolo Peak that looked like the best skiing for my abilities, sticking to slopes of less than 34 degrees when possible. Also, I tried to avoid skiing on slopes that could turn out to be cliffs or are most likely to be avalanche prone, or under slopes that looked like they had a high probability of avalanches. Avalanches are most common on slopes between 30 and 45 degrees. On the CalTopoSlope layer, that means avoiding slopes highlighted in red or purple. Picking an avalanche safe route is more complicated than staying off slopes of a certain steepness, however, knowing the topography of your trip is one important step in choosing your route. My route did include what looks like avalanche prone slopes, which means that I would attempt this trip when the snow layers had consolidated, and risk of slides decreases - probably in the Spring. Greg’s trip was in mid-May. Another important factor that I did not take into account in my route is bushwhacking. 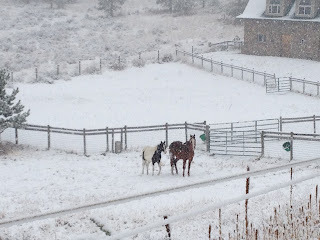 I am new to the Bitterroots, and so I don’t know how much bushwhacking is entailed in traversing the valleys in snow. 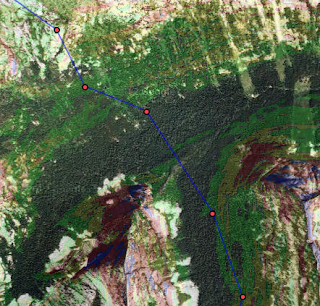 I can check for tree coverage by using the satellite layer in hillmap.com. I overlaid the satellite image on my route on the Data & Analysis page. Below is a section of the route with the satellite overlay. Looks like there will be sections of trees on this route. I’ll need to take a couple of scouting trips this winter to determine if treed sections of the map translate into epic bushwhacking or fun tree skiing, and adjust my route accordingly. 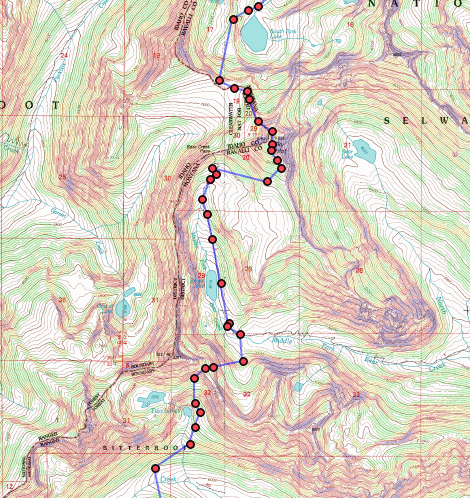 Here’s a link to my topo map for you to view, print and play with. Make sure to zoom in to see route detail. You can change sections of the route on the Paths page at hillmap.com.